The demise of quackademia. Progress in the last 5 years leaves Michael Driscoll and Geoffrey Petts isolated. Since writing about anti-scientific degrees in Nature (March 2007), much has been revealed about the nonsense that is taught on these degrees. New Year’s day seems like a good time to assess how far we’ve got, five years on. At the beginning of 2007 UCAS (the universities central admission service) offered 45 different BSc degrees in quackery, at 16 universities. Now there are only 24 such degrees. If you exclude chiropractic and osteopathy, which all run at private colleges, with some sort of "validation" from a university, there are now only 18 BSc/MSc courses being offered in eight universities. Degrees in homeopathy, naturopathy and "nutritional therapy", reflexology and aromatherapy have vanished altogether from UCAS. In the race to provide BScs in anti-science, Middlesex University has now overhauled the long-standing leader, Westminster, by a short head. The University of Central Lancashire (UCLAN) was the first to see sense. In August 2008 they announced closure of their “BSc” degree in homeopathy. On September 2008 they announced an internal review of their courses in homeopathy. herbalism and acupuncture. The report of this review closed down all of them in July 2009. I first asked for their teaching materials in July 2006. I finally got them in December 2010, after winning an appeal to the Information Commissioner, and then winning an appeal against that decision at an Information tribunal . By the time I got them, the course had been closed for over two years. That is just as well, because it turned out that UCLAN’s students were being taught dangerous nonsense. No wonder they tried so hard to conceal it. Salford University was the next to go. They shut down their courses in complementary medicine, homeopathy and acupuncture. In January 2009 they announced " they are no longer considered “a sound academic fit” ". Shortly afterwards. a letter appeared in The Times from three heavyweights (plus me) congratulating the vice-chancellor on his decision. For many years, Westminster was the biggest supplier of BSc degrees in quackery. At the beginning of 2007 they offered 14 different BSc degrees in homeopathy, naturopathy, nutritional therapy, "complementary therapies", (western) herbal medicine and traditional Chinese medicine with acupuncture. Some of their courses were so bizarre that some of the students and even staff sent me slides which taught things like "amethysts emit high Yin energy". Like UCLAN, Westminster also held an internal review. Unlike UCLAN it came to the absurd conclusion that all would be well if they injected more science into the courses. The incompetence of the review meant that those who wrote it hadn’t noticed that if you try to put science into homeopathy or naturopathy, the whole subject vanishes in a puff of smoke. Nevertheless Westminster closed down entry to BSc homeopathy in March 2009 (though the subject remained as part of other courses). Three years after the Nature article, all five BSc homeopathy degrees had shut their doors. More dangerous nonsense from the University of Westminster: when will Professor Geoffrey Petts do something about it? Now Westminster has only four courses in two subjects. They still teach some dangerous and untrue things, but I suspect the writing is on the wall for these too. All but Chinese medicine and Herbal medicine have already gone. Almost there. Since my first post in 2008 about the validation scam operated by the University of Wales, and some good investigations by BBC Wales TV, the outcome was the most spectacular so far. The entire institution collapsed. They no longer "validate" external degrees at dodgy business colleges, loony religious colleges or magic medicine colleges. Another worthless validation: the University of Wales and nutritional therapy (October 2008) This is a ‘degree’ in nutrtional therapy. It is even more hilarious than usual, but it passed the validation anyway. Scandal of the University of Wales and the Quality Assurance Agency (November 2010). This post followed the BBC Wales TV programme. At last the QAA began to notice, yet further confirmation of its utter ineptitude. The University of Wales disgraced (but its vice chancellor is promoted) (October, 2011) The eventual collapse of the university was well-deserved. But it is very weird that the people who were responsible for it have still got their jobs. In fact the vice-chancellor, Marc Clement, was promoted despite his mendacious claim to be unaware of what was going on. It remains to be seen how many of the many quack courses that were validated by the University of Wales will be taken on by other universities. The McTimoney College of Chiropractic is owned by BPP University (so much for their quality control, as explained in Private Eye). but still claims to be validated by Wales until 2017. Edinburgh Napier University. After an FOI request (rejected), Napier closed their herbal medicine degree in 2010. Anglia Ruskin Univerity Not only have BSc degrees gone in aromatherapy and reflexology, but their midwifery degree now states "We are unable to accept qualifications in aromatherapy, massage and reflexology." Chiropractic Surprisingly, given the total discreditation of chiropractic in the wake of the Simon Singh affair, and the internecine warfare that followed it, none of the chiropractic courses have shut yet. Some are clearly in trouble, so watch this space. Osteopathy has also had no course closures since 2007. Like chiropractic it also suffers from internecine warfare. The General Osteopathic Council refuses to disown the utter nonsense of "craniosacral" osteopathy. But the more sensible practitioners do so and are roughly as effective as physiotherapists (though there are real doubts about how effective that is). Excluding chiropractic and osteopathy, this is all that’s left. It now consists almost entirely of Chinese medicine and a bit of herbal. Cardiff Metropolitan University (UWIC) (Known as University of Wales Institute Cardiff (UWIC) until Nov 2011.) The vice-chancellor of Cardiff Metropolitan, Antony Chapman, is in the QAA’s board of directors, so perhaps it isn’t surprising that the QAA has done nothing. It seems that acupuncture hangs on in universities that are right at the bottom of the rankings. Manchester Metropolitan gets the booby prize for actually starting a new course, just as all around are closing theirs. Dr Peter Banister, who was on the committee that approved the course (but now retired), has told me ” I am sceptical in the current economic climate whether it will prove to be successful”. Let’s hope he’s right. But well done Westminster. Your position as the leader in antiscientific degrees has now been claimed by Middlesex University. Their "degrees" in Ayurveda mark out Middlesex University as the new King of Woo. Over to you, Professor Driscoll. As vice-chancellor of Middlesex University, the buck stops with you. In contrast to the large reduction in the number of BSc and MSc degrees, there has actually been an increase in two year foundation degrees and HND courses in complementary medicine, at places right near the bottom of the academic heap. The subject is sinking to the bottom. With luck it will vanish entirely from universities before too long. Although all of the degrees in magic medicine are from post-1992 universities, the subject has crept into more prestigious universities. Of these, the University of Southampton is perhaps the worst, because of the presence of George Lewith, and his defender, Stephen Holgate. Others have staunch defenders of quackery, including the University of Warwick, University of Edinburgh and St Batholomew’s. Why have all these courses closed? One reason is certainly the embarrassment caused by exposure of what’s taught on the courses. Professors Petts (Westminster) and Driscoll (Middlesex) must be aware that googling their names produces references to this and other skeptical blogs on the front page. Thanks to some plain brown emails, and, after a three year battle, the Freedom of Information Act, it has been possible to show here the nonsense that has been foisted on students by some universities. Not only is this a burden on the taxpayer, but, more importantly, some of it is a danger to patients. When a course closes, it is often said that it is because of falling student numbers (though UCLAN and Salford did not use that excuse). Insofar as that is true, the credit must go to the whole of the skeptical movement that has grown so remarkably in the last few years. Ben Goldacre’s "ragged band of bloggers" have produced a real change in universities and in society as a whole. The people who should have done the job have either been passive or an active hindrance. The list is long. Vice-chancellors and Universities UK (UUK), the Quality Assurance Agency (QAA), the Hiigher Education Funding Council England (HEFCE), Skills for Health, the Medicines and Health Regulatory Authority ( MHRA) , the Health Professions Council (HPC), the Department of Health, the Prince of Wales and his reincarnated propaganda organisation, the "College of Medicine", the King’s Fund, the Universities and Colleges Union (UCU), OfQual, Edexcel, National Occupational Standards and Qualifications and the Curriculum Authority (QCA). Whatever happened to that "bonfire of the quangos"? 2 January 2012 The McTimoney College of Chiropractic (owned by BPP University) claims that its “validation” by the University of Wales will continue until 2017. This contradicts the statement from UoW. Watch this space. 3 January 2012. Thanks to Neil O’Connell for drawing my attention to a paper in Pain. The paper is particularly interesting because it comes from the Southampton group which has previously been sympathetic to acupuncture. Its authors include George Lewith. It shows, yet again that there is no detectable difference between real and sham acupuncture treatment. It also shows that the empathy of the practitioner has little effect: in fact the stern authoritarian practitioner may have been more effective. Sadly. the trial didn’t include a no-treatment group, so it is impossible to say how much of the improvement is regression to the mean and how much is a placebo effect. The authors admit that it could be mostly the former. Surely now the misplaced confidence in acupuncture shown by some medical and university people must be in tatters. In yet another sign that even acupuncture advovates are beginning to notice that it doesn’t work, a recent article Paradoxes in Acupuncture Research: Strategies for Moving Forward, shows some fascinating squirming. 3 January 2012. The Daily Telegraph has carried a piece about closure of university courses, written by Michael Hanlon. On 31 January they carried a much longer piece. 3 January 2012. It is a great pity that some physiotherapists seem to have fallen hook, line and sinker for the myths of acupuncture. Physiotherapists are, by and large, the respectable face of manipulative therapy. Their evidence base is certainly not all one would wish, but at least they are free of the outrageous mumbo humbo of chiropractors. Well, most of them are, but not the Acupuncture Association of Chartered Physiotherapists (AACP), or, still worse, The Association of Chartered Physiotherapists in Energy Medicine, a group that is truly away with the fairies. These organisations are bringing a very respectable job into disrepute. And the Health Professions Council, which is meant to be their regulator, has, like most regulators, done nothing whatsoever to stop it. 5 January 2012. Times Higher Education gives a history of the demise of the University of Wales, Boom or Bust. It’s a useful timeline, but like so many journalists, it’s unwilling to admit that bloggers were on to the problem long before the BBC, never mind the QAA. There was also a leader on the same topic, Perils of the export business. It again fails to take the QAA to task for its failures. Interviews for Deutsche Welle and Middle East Broadcasting Center TV. I work full time as a team leader for a pension company but I am also a kinesiologist and work in my spare time doing kinesiology, reiki and Indian head massage. Evidently she’s a believer in the barmiest and totally disproved forms of magic medicine. And Middlesex University will give her a Master of Science degree. I have to say I find it worrying that she’s a team leader for a pension company. Does she also believe in the value of worthless derivatives. I wonder? 18 January 2012. the story has gone international, with an interview that I did for Deutsche Welle, UK universities drop alternative medicine degree programs. I’m quoted as saying “They’re dishonest, they teach things that aren’t true, and things that are dangerous to patients in some cases”. That seems fair enough. The Daily Telegraph carried a prominent 1200 word account (the title wasn’t mine). The published version was edited slightly. Can’t resist another bit of straight plagiarism. In this week’s Times Higher Education, the inimitable Laurie Taylor wrote this. Professor Georgina Kunzite, the Head of our Department of Crystal Healing, has reacted strongly to the recent High Court ruling that the University of Central Lancashire must hand over teaching materials from its defunct homeopathy course to a campaigning sceptic. Speaking to our reporter, Keith Ponting (30), she said she had no intention of acceding to any similar request for materials from her own oversubscribed course in crystal therapy. Such a move, she argued, risked undermining the power of the crystals, which were notoriously wary of attempts to question their curative validity. Well well, where could he have got that idea? It seems very reasonable to suggest that taxpayers have an interest in knowing what is taught in universities. The recent Pittilo report suggested that degrees should be mandatory in Acupuncture, Herbal Medicine and Traditional Chinese Medicine. So it seems natural to ask to see what is actually taught in these degrees, so one can judge whether it protects the public or endangers them. Since universities in the UK receive a great deal of public money, it’s easy. Just request the material under the Freedom of Information Act. Well, uh, it isn’t as simple as that. Every single application that I have made has been refused. After three years of trying, the Information Commissioner eventually supported my appeal to see teaching materials from the Homeopathy "BSc" at the University of Central Lancashire. He ruled that every single objection (apart from one trivial one) offered by the universities was invalid. In particular, it was ruled that univerities were not "commercial" organisations for the purposes of the Act. So problem solved? Not a bit of it. I still haven’t seen any of the materials from the original request because the University of Central Lancashire appealed against the decision and the case of University of Central Lancashire v Information Commissioner is due to be heard on November 3rd, 4th and 5th in Manchester. I’m joined (as lawyers say) as a witness. Watch this space. UCLan is not the exception. It is the rule. I have sought under the Freedom of Information Act, teaching materials from UClan (homeopathy), University of Salford (homeopathy, reflexology and nutritional therapy), University of Westminster (homeopathy, reflexology and nutritional therapy), University of West of England, University of Plymouth and University of East London, University of Wales (chiropractic and nutritional therapy), Robert Gordon University Aberdeen (homeopathy), Napier University Edinburgh (herbalism). In every single case, the request for teaching materials has been refused. And that includes the last three, which were submitted after the decision of the Information Commissioner. They will send things like course validation documents, but these are utterly uninformative box-ticking documents. They say nothing whatsoever about what is actually taught. The fact that I have been able to discover quite a lot about what’s being taught owes nothing whatsoever to the Freedom of Information Act. It is due entirely to the many honest individuals who have sent me teaching materials, often anonymously. We should be grateful to them. Their principles are rather more impressive than those of their principals. Since this started about three years ago, two of the universities, UCLan and Salford, have shut down entry to all of their CAM courses. And Westminster has shut two of them, with more rumoured to be closing soon. They are to be congratulated for that, but is far from being the end of the matter. The Department of Health, and some of the Royal Colleges, have yet to catch up with the universities, The Pittolo report, which recommends making degrees compulsory, is being considered by the Department of Health. The consultation ends on November 2nd: if you haven’t yet responded, please do so now (see how here, and here). Several of the universities claim that they cannot send teaching materials, because they have no access to them. This happens when the university has accredited a course that is run by another, privately run, institution. The place that does the actual teaching, being private, is exempt from the Freedom of Information Act. The ludicrous corollary of this excuse is that the university has accredited the course without checking on what is taught, and in some cases without even having seen a timetable. In fact the University of Wales doesn’t run courses at all. Like the (near moribund) University of London, it acts as a degree-awarding authority for a lot of Welsh Universities. It also validates a lot of courses in non-university institutions, 34 or so of them in the UK, and others scattered round the world. Many of them are theological colleges. It does seem a bit odd that St Petersburg Christian University, Russia, and International Baptist Theological Seminary, Prague, should be accredited by the University of Wales. They also validate the International Academy of Osteopathy, Ghent (Belgium), Osteopathie Schule Deutschland, the Istituto Superiore Di Osteopatia, Milan, the Instituto Superior De Medicinas Tradicionales, Barcelona, the Skandinaviska Osteopathögskolan (SKOS) Gothenburg, Sweden and the College D’Etudes Osteopathiques, Canada. The 34 UK institutions include the Scottish School of Herbal Medicine, the Northern College of Acupuncture and the Mctimoney College of Chiropractic. The case of the Nutritional Therapy course has been described already in Another worthless validation: the University of Wales and nutritional therapy. It emerged that the course was run by a grade 1 new-age fantasist. It is worth recapitulating the follow up. Professor Clement to try to discover whether it is true that the validation process had indeed missed the fact that the course organiser’s writings had been described as “preposterous, made-up, pseudoscientific nonsense” in the Guardian. So far I have had no reply from the vice-chancellor, but on 26 October I did get an answer from Prof Palastanga. As regards the two people you asked questions about – J.Young – I personally am not familiar with her book and nobody on the validation panel raised any concerns about it. As for P.Holford similarly there were no concerns expressed about him or his work. In both cases we would have considered their CV’s as presented in the documentation as part of the teaching team. In my experience of conducting degree validations at over 16 UK Universities this is the normal practice of a validation panel. I have to say this reply confirms my worst fears. Validation committees such as this one simply don’t do their duty. They don’t show the curiosity that is needed to discover the facts about the things that they are meant to be judging. How could they not have looked at the book by the very person that they are validating? After all that has been written about Patrick Holford, it is simply mind-boggling that the committee seems to have been quite unaware of any of it. It is yet another example of the harm done to science by an unthinking, box-ticking approach. Incidentally, Professor Nigel Palastanga has now been made Pro Vice-Chancellor (Quality) at the University of Wales and publishes bulletins on quality control. Well well. They did give me enough information to ask for a sample of the teaching materials on particular topics. But I gor blank refusal, on the grounds that they didn’t possess them. Only McTimoney had them. Their (unusually helpful) Freedom of Information officer replied thus. So the university doesn’t know the timetable. It doesn’t know what is taught in lectures, but it is " entirely clear about the content of the course". This response can be described only as truly pathetic. Either this is a laughably crude form of obstruction of my request, or perhaps, even more frighteningly, the university really believes that its endless box-ticking documents actually provide some useful control of quality. Perhaps the latter interpretation is more charitable. After all, the QAA, CHRE, UUK and every HR department share similar delusions about what constitutes quality. Perhaps it is just yet another consequence of having science run largely by people who have never done it and don’t understand it. Validation is a business. The University of Wales validates no fewer than 11,675 courses altogether. Many of these are perfectly ordinary courses in universities in Wales, but they validate 594 courses at non-Welsh accredited institutions, an activity that earned them £5,440,765 in the financial year 2007/8. There’s nothing wrong with that if they did the job properly. In the two cases I’ve looked at, they haven’t done the job properly. They have ticked boxes but they have not looked at what’s being taught or who is teaching it. The University of Kingston offers a “BSc (Hons)” in acupuncture. In view of the fact that the Pittilo group has recommended degrees in acupuncture, there is enormous public interest in what is taught in such degrees, so I asked. They sent the usual boring validation documents and a couple of sample exam papers . The questions were very clinical, and quite beyond the training of acupuncturists. The validation was done by a panel of three, Dr Larry Roberts (Chair, Director of Academic Development, Kingston University), Mr Roger Hill (Accreditation Officer, British Acupuncture Accreditation Board) and Ms Celia Tudor-Evans (Acupuncturist, College of Traditional Acupuncture, Leamington Spa). So nobody with any scientific expertise, and not a word of criticism. (2) I cannot see where the students are taught about research methods and statistics. I would like to see Lecture handouts/notes and PowerPoint presentations for teaching in this area, but the ‘timetables’ that you sent don’t make clear when or if it is taught. The BSc Acupuncture is delivered by a partner college, the College of Integrated Chinese Medicine (CICM), with Kingston University providing validation only. As such, the University does not hold copies of the teaching materials used on this course. In order to obtain copies of the teaching materials required you may wish to contact the College of Integrated Chinese Medicine directly. This completes the University’s response to your information request. Yes I am exceedingly unhappy about it. The university attaches its name to the course so it must obviously be able to get the material simply by asking for it (I’m surprised that the university should endorse a course without knowing what is taught on it, but that’s another matter). I request formally that you obtain this material. If necessary please read this as a formal appeal. I await with interest. In every single case so far, the internal review has merely confirmed the initial refusal. It means a bit of a delay before the case goes to the Information Commisssioner’s Office. Napier University runs a "BSc (Hons) Herbal medicine". (brochure here). Since herbal medicine is a subject of the Pittilo recommendations, there is enormous public interest in what they teach. So I asked, under the Freedom of Information (Scotland) Act (2002). They sent quite quickly validation and accreditation documents, some examination papers, timetables and lecture lists. The validation was the usual vacuous box-ticking stuff though it did reveal that the course “made extensive use of techniques such as tongue and pulse diagnosis”, which are well known phoney diagnosis methods, about as much use as a pendulum (as used at Westminster University). How one would like to see what the students said, and, even more one would like to see the model answer. Amateurs who try to treat potentially serious conditions are a danger to the public. So then we got to the interesting bit, the request for actual teaching materials. Research methods, clinical trial design and statistics. The matter is now under internal appeal (read the appeal) and eventually we shall find out whether the Scottish Information Commissioner backs the judgement. This case has particular interest because the Vice-Chancellor of Robert Gordon University is Professor Michael Pittilo, chair of the highly contentious steering group that recommended degress in CAM. Robert Gordon University (RGU) does not teach herbal medicine or acupuncture. But they do run An Introduction to Homeopathy. All the degrees in homeopathy have closed. It is perhaps the daftest and most discredited of all the popular forms of Magic Medicine. But Professor Pittilo thinks it is an appropriate subject to teach in his university. So again I asked for information under the Freedom of Information (Scotland) Act 2002. They sent me quite quckly a list of the powerpoint presentations used on the courses [download it]. I asked for a small sample of the powerpoints. And again the university did not possess them! I should like to see only the following three powerpoint presentations in the first instance, please. Please can you let me know also who produced the powerpoints. I note that you will have to request them but since they are being offered as part of a course offered by RGU, so RGU is responsible for their quality, I presume that this should cause no problem. “it is mainly the quality of our courses (including course material) and teaching which has given us the position of "the best modern university in Scotland"
I am bound to ask, if the university is so proud of its course material, why is it expending so much time and money to prevent anyone from seeing a small sample of it? My appeal has been sent to the Scottish Information Commissioner [download the appeal]. What are vice-chancellors thinking about? I find it very difficult to imagine what is going through the heads of vice-chancellors who run courses in mumbo-jumbo. Most of them don’t believe a word of it (though Michael Pittilo might be an exception) yet they foist it on their students. How do they sleep at night? Recently the excellent Joe Collier wrote a nice BMJ blog which applauded the lack of respect for authority in today’s students, Joe Collier says good riddance to old-fashioned respect. I couldn’t resist leaving a comment. I couldn’t agree more. There is nothing quite so unnerving as being addressed as “Sir”. It is an advantage of age that you realise what second-rate people come to occupy very grand positions. Still odder since, if occasionally they are removed for incompetence, they usually move to an even grander position. I guess that when I was an undergraduate, I found vice-chancellors somewhat imposing. That is, by and large, not a view that survives closer acquaintance. Should teaching materials be open to the public? There is only one university in the world that has, as a matter of policy, made all of its teaching material open to the public, that is the Massachusetts Institute of Technology (MIT). I can recommend strongly course 18.06, a wonderful set of lectures on Linear Algebra by Gilbert Strang. (It is also a wonderful demonstration of why blackboards may be better than Powerpoint for subjects like this). Now they are on YouTube too. A lot of other places have made small moves in the same direction, as discussed recently in Times Higher Education, Get it Out in the Open. Now the OU is working with other British universities to help them develop and share open course materials. In June, at the celebrations for the 40th anniversary of the OU, Gordon Brown announced funding to establish the Support Centre for Open Resources in Education at the OU, as part of a £7.8 million grant designed to enhance the university’s national role. The funding follows a separate grant of £5.7 million from the Higher Education Funding Council for England for universities across the sector to make thousands of hours of free learning materials available. Much material is available on the web, when individual teachers choose to place it there, but at the same time there is a move in the other direction. In particular, the widespread adoption of Moodle has resulted in a big decrease in openness. Usually you have to be registered on a course to see the material. Even other people in the university can’t see it. I think that is a deplorable development (so, presumably, does HEFCE). The only conclusion to be drawn from this is that “quality arrurance procedures” work about as well in universities as they did in the case of baby Peter. No doubt they were introduced with worthy aims. But in practice they occupy vast amounts of time for armies of bureaucrats, and because the brain does not need to be engaged they end up endorsing utter nonsenes. The system is broken. It is hard to keep secrets in the internet age. Thanks to many wonderful people who have sent me material. you can see plenty of what is taught, despite the desperate attempts of vice-chancellors to conceal it. Try these links. The last BSc (Hons) Homeopathy closes! But look at what they still teach at Westminster University. Bad medicine. Barts sinks further into the endarkenment. This post has been translated into Belorussian..
Chinese medicine and herbal medicine are in the news at the moment. There is a real risk that the government could endorse them by accepting the Pittilo report. In my view traditional Chinese medicine endangers people. The proposed ‘regulation’ would do nothing to protect the public. Quite on the contrary, it would add to the dangers, by giving an official stamp of approval while doing nothing for safety. The government’s idea of improving safety is to make sure that practitioners are ‘properly trained’. But it is the qualifications that cause the danger in the first place. The courses teach ideas that are plain wrong and often really dangerous. Why have government (and some universities) not noticed this? That’s easy to see. Governments, quangos and university validation committees simply don’t look. They tick boxes but never ask what actually goes on. Here’s some examples of what goes on for them to think about. They show clearly the sort of dangerous rubbish that is taught on some of these ‘degrees’. Curious indeed. The fantasy gobbledygook gets worse. Now it is getting utterly silly. Teaching students that the brain is made of marrow is not just absurd, but desperately dangerous for anyone unlucky (or stupid) enough to go to such a person when they are ill.
Here’s another herbal lecture., and this time the topic is serious. Cancer. Herbal approaches for patients with cancer. I’ve removed the name of the teacher to spare her the acute embarrassment of having these dangerous fantasies revealed. The fact that she probably believes them is not a sufficient excuse for endangering the public. There is certainly no excuse for the university allowing this stuff to be taught as part of a BSc (Hons). First get them scared with some bad statistics. No fuss there about distinguishing incidence, age-standardisation and death rates. And no reference. Perhaps a reference to the simple explanation of statistics at Cancer Research UK might help? Perhaps this slide would have been better (from CDC). Seems there is some mistake in slide 2. Slide 11 is mostly meaningless. “Strengthen vitality” sounds good but means nothing. And “enhancing the immune system” is what alternative medicine folks always say when they can think of nothing else. Its meaning is ill-defined and there is no reason to think that any herbs do it. The idea of a ‘tonic’ was actually quite common in real medicine in the 1950s. The term slowly vanished as it was realised that it was a figment of the imagination. In the fantasy world of alternative medicine, it lives on. Detoxification, a marketing term not a medical one, has been extensively debunked quite recently. The use of the word by The Prince of Wales’ company, Duchy Originals recently fell foul of the Advertising Standards Authority, and his herbal ‘remedies’ were zapped by the MHRA (Medicines and Health Regulatory Authority). And of course the antioxidant myth is a long-disproved hypothesis that has become a mere marketing term. “Inhibits the recurrence of cancer”! That sounds terrific. But if it is so good why is it not even mentioned in the two main resources for information about herbs? It seems odd, then, that NeLCAM does not seem to thnk to think that Centella asiatica, is even worth mentioning. In the USA we have the National Center for Alternative and Complementary Medicine (NCCAM), an organisation that is so friendly to alternative medicine that it has spent a billion dollars on research in the area, though it has produced not a single good treatment for that vast expenditure. But NCCAM too does not even mention Centella asiatica in its herb list. It does get a mention in Cochrane reviews but only as a cosmetic cream and as an unproven treatment for poor venous circulation in the legs. What on earth is a “lymph remedy”. Just another marketing term? That is a very dramatic claim. It as as though the hapless students were being tutored in doublespeak. What is meant by “especially valuable in the treatment of”? Clearly a desperate patient would interpret those words as meaning that there was at least a chance of a cure. That would be a wicked deception because there isn’t the slightest reason to think it works. Once again there this wondrous cure is not even mentioned in either NELCAM or NCCAM. Phytolacca is mentioned, as Pokeweed, in Wikipedia but no claims are mentioned even there. And it isn’t mentioned in Cochrane reviews either. The dramatic claims are utterly unfounded. Ah the mistletoe story, again. NHS Evidence (NeLCAM) lists three completed assessments. One concludes that more research is needed. Another concludes that “Rigorous trials of mistletoe extracts fail to demonstrate efficacy of this therapy”, and the third says “The evidence from RCTs to support the view that the application of mistletoe extracts has impact on survival or leads to an improved ability to fight cancer or to withstand anticancer treatments is weak”. More than 30 human studies using mistletoe to treat cancer have been done since the early 1960s, but major weaknesses in many of these have raised doubts about their findings (see Question 6). Very few bad side effects have been reported from the use of mistletoe extract, though mistletoe plants and berries are poisonous to humans (see Question 7). The U.S. Food and Drug Administration (FDA) has not approved mistletoe as a treatment for cancer or any other medical condition (see Question 8). The FDA does not allow injectable mistletoe to be imported, sold, or used except for clinical research (see Question 8). Cochrane reviews lists several reviews of mistletoe with similar conclusions. For example “The evidence from RCTs to support the view that the application of mistletoe extracts has impact on survival or leads to an improved ability to fight cancer or to withstand anticancer treatments is weak”. Anthroposophy is one of the highest grades of fantasy you can find. A post on that topic is in the works. “Indicated for cancers . . . colon/rectal, uterine, breast, lung“. A cure for lung cancer? That, of course, depends on how you interpret the weasel words “indicated for”. Even Wikipedia makes no mention of any claims that Thuja benefits cancer. NHS Evidence (NeLCAM) doesn’t mention Thuja for any indication. Neither does NCCAM. Nor Cochrane reviews. That is not the impression the hapless students of this BSc lecture were given. In my view suggestions that you can cure lung cancer with this tree are just plain wicked. Pure snake oil, and not even spelled correctly, Harry Hoxsey’s treatment centres in the USA were closed by court order in the 1950s. At least this time it is stated that there is no hard evidence to support this brand of snake oil. More unfounded claims when it says “treated successfully many cancer patients”. No references and no data to support the claim. It is utterly unfounded and claims to the contrary endanger the public. Gerson therapy is one of the most notorious and unpleasant of the quack cancer treatments. The Gerson Institute is on San Diego, but their clinics are in Mexico and Hungary. It is illegal in the USA. According to the American Cancer Society you get “a strict low-salt, low-fat, vegetarian diet and drinking juice from about twenty pounds of fresh fruits and vegetables each day. One glass of juice is consumed each hour, thirteen times a day. In addition, patients are given several coffee enemas each day. Various supplements, such as potassium, vitamin B12, pancreatic enzymes, thyroid hormone, and liver extracts, are used to stimulate organ function, particularly of the liver and thyroid.”. At one time you also got several glasses of raw calf liver every day but after infections killed several people] carrot juice was given instead. Cancer Research UK says “there is no evidence to show that Gerson therapy works as a cure for cancer”, and “The Gerson diet can cause some very serious side effects.” Nobody (except perhaps the Price of Wales) has any belief in this unpleasant, toxic and expensive folk-lore. Again patients are endangered by teaching this sort of stuff. And finally, the usual swipe at vaccines. It’s nothing to do with herbalism. but just about every alternative medicine advocate seems to subscribe to the anti-vaccination lobby.. It is almost as though they have an active preference for things that are known to be wrong. They seem to believe that medicine and science are part of an enormous conspiracy to kill everyone. Perhaps this dangerous propaganda might have been ameliorated if the students had been shown this slide (from a talk by Melinda Wharton). Left to people like this, we would still have smallpox, diphtheria. tetanus and rabies, Take a look at Vaccine-preventable diseases. This is the sort of ‘education’ which the Pittilo report wants to make compulsory. Smallpox in Baltimore, USA, 1939. This man was not vaccinated. This selection of slides shows that much of the stuff taught in degrees in herbal medicine poses a real danger to public safety and to public health. Pittilo’s idea that imposing this sort of miseducation will help safety is obviously and dangerously wrong. The Department of Health must reject the Pittilo recommendations on those grounds. The much-delayed public consultation on the Pittilo report has just opened. It is very important that as many people as possible respond to it. It’s easy to say that the consultation is sham. It will be if it is left only to acupuncturists and Chinese medicine people to respond to it. Please write to them before the closing date, November 2nd 2009. The way to send your evidence is here. Here are three documents that I propose to submit in response to the consultation.I ‘d welcome criticisms that might make it more convincing. Use any parts of them you want in your own response. Submission to the Department of Health, for the consultation on the Pittilo report [download pdf]. I’ve written quite a lot about the Pittilo report already, in particular A very bad report: gamma minus for the vice-chancellor, and in The Times (see also the blog version). Intriguingly, these posts are at number 2 in a Google search for “Michael Pittilo”. Briefly, the back story is this. It is now over a year since the Report to Ministers from “The Department of Health Steering Group on the Statutory Regulation of Practitioners of Acupuncture, Herbal Medicine, Traditional Chinese Medicine and Other Traditional Medicine Systems Practised in the UK” [download the report]. The chair of the steering group was Professor R. Michael Pittilo, Principal and Vice-Chancellor of The Robert Gordon University, Aberdeen. The reason thet the report is so disastrously bad in its assessment of evidence is that it was written entirely by people with vested interests. The committee consisted of five acupuncturists, five herbalists and five representatives of traditional Chinese medicine (plus eleven observers). There was not a single scientist or statistician to help in the assessment of evidence. And it shows: The assessment of the evidence in the report was execrable. Every one of the committee members would have found themselves out of work if they had come to any conclusion other than that their treatment works, Disgracefully, these interests were not declared in the report, though they are not hard to find. The university of which the chair is vice-chancellor runs a course in homeopathy, the most discredited of the popular forms of alternative medicine. That tells you all you need to know about the critical faculties of Michael Pittilo. Let’s consider the virtue of these two recommendations. For a start, this should be ruled out by the HPC’s own rules, which require “Practise based on evidence of efficacy” as a condition for registration. Since there is practically no “evidence of efficacy”, it follows that the HPC can’t regulate acupuncture, herbal and Chinese medicine as Pittilo recommends. Or so you’d think. But the official mind seems to have an infinite capacity for doublespeak. The HPC published a report on 11 September 2008, Regulation of Medical Herbalists, Acupuncturists and Traditional Chinese Medicine Practitioners. 1. Medical herbalists, acupuncturists and traditional Chinese medicine practitioners should be statutorily regulated in the public interest and for public safety reasons. 2. The Health Professions Council is appropriate as the regulator for these professions. 3. The accepted evidence of efficacy overall for these professions is limited, but regulation should proceed because it is in the public interest. In other words, the HPC simply decided to ignore its own rules, Its excuse for doing so is that regulation would protect “public safety” . But it simply would not do that. It is ell known that some Chinese herbs are adulterated with dangerous substances, but laws against that already exist. Trading Standards are much more likely to take appropriate action than the HPC. The Medicines and Health Regulatory Authority (MHRA) already deals with the licensing of herbal medicines. and, despite the fact that it recently betrayed its trust by allowing them to be labelled in a misleading way, they are the people to do it, not the HPC. In future, it is hoped that more Government funding can be allocated to research into traditional/herbal medicines and acupuncture and that grants will become available to encourage practitioners to undertake postgraduate research work. So they are asking for more government money. In March 2007, the Chinese Government pledged to spend over $130 million over the next five years on research into the effectiveness of traditional Chinese medicine. It is to be hoped that this money will be targeted effectively to evaluate TCM. It seems to have escaped the notice of Pittilo that roughly 100 percent of trials of Chinese medicine done in China come out positive. Elsewhere, very few come out positive,(see Vickers et al., 1998, Controlled Clinical Trials, 19, 159-166: download reprint) The Department of Health would be unwise to rely on Chinese research. Remember that modern acupuncture was not so much a product of ancient wisdom, but rather it stems from nationalist propaganda by Mao Tse-Tung, who needed a cheap way to keep the peasants quiet, though he was too sensible to use it himself. The proposed regulation would endanger the public, not protect it. The excuse given by the HPC for breaking its own rules is that it should do so to protect the public. So first we need to identify what dangers are posed by acupuncture, herbal medicine and traditional Chinese medicine. Herbal medicines are unstandardised, so even the very few that may work are dangerous to patients because the dose of active principle is unknown and varies from one batch to another. Taking a herbal medicine is a bit like swallowing a random number of tablets, False health claims pose a danger to patients too, when they cause patients to avoid treatments that work. Traditional Chinese Medicine is probably the most dangerous. Like the other two, the medicines are unstandardised so the dose is never known. False health claims abound. And in addition to these dangers, many cases have been found of Chinese medicines being adulterated with poisonous substances or with conventional drugs. The form of regulation proposed by Pittilo would do little or nothing to protect the public from any of these dangers. The proposals accept the herbal and Chinese medicine as traditionally practised. Nothing would be done about one of the major dangers, the lack of standardisation. That is a problem that was solved by pharmacologists in the 1930s, when international standards were set for the biological activity of things like tincture of digitalis, and assays were devised so that different batches could be adjusted to the same potency. Now, 80 years later, it is being proposed by Pittilo that we should return to the standards of safety that existed at the beginning of the last century. That is a threat to public safety., but the proposed regulation would do nothing whatsoever to protect the public from this dangerous practice. On the contrary, it would give official government sanction to it. The other major danger is that patients are deceived by false health claims. This is dangerous (as well as dishonest) because it can cause patients to avoid treatments that work better, The internet abounds with claims that herbs can cure anything from diabetes to cancer. Many are doubtless illegal, but regulators like the HPC have traditionally ignored such claims: they are left to Trading Standards, Advertising Standards and the Medicines and Health Regulatory Authority (MHRA) to deal with. The MHRA already also has responsibility for monitoring side effects. The HPC would not do this. The foolishness of allowing statutory regulation for unproven treatments has recently been illustrated quite dramatically by the case of chiropractic. Chiropractors have had statutory regulation by the General Chiropractic Council, which was established by the Chiropractors Act of 1994. The British Chiropractic Association (BCA) recently decided to sue the science writer, Simon Singh, for defamation when he cast doubt on some of the claims made by chiropractors, in particular their claims to be able to cure colic and asthma in children. That led to close examination of the claims. In fact there is no reason to think that spinal manipulation works for asthma, or that it works for colic. In fact there is quite good evidence that the claims are false. The result was that about 600 well-justified complaints have been lodged with the GCC (enough to bankrupt the GCC if the complaints are dealt with properly). The point of this story is that the statutory regulator had nothing whatsoever to prevent these false health claims being made. Two of the complaints concern practices run by the chair of the GCC. Worse, the GCC actually endorsed such claims. The statutory regulator saw its duty to defend chiropractic (apart from a handful of cases of sexual misdemeanours), not to protect the patient from false health claims. The respectability conferred by statutory regulation made false health claims easier and endangered the public. It would be a disaster if the same mistake were made again. in our opinion a lack of evidence of efficacy would not impede our ability to set standards or deal with complaints we receive. The vast majority of cases we consider are related to conduct. But perhaps that is because they haven’t tried “regulating” quacks before. Now that the public is far more conscious about health fraud than it used to be, one can predict confidently that the HPC would be similarly overwhelmed by a deluge of complaints about the unjustified health claims made by acupuncturists, herbal medicine and traditional Chinese medicine practitioners. There is no shortage of them to complain about. There are two very big problems with this recommendation. The time for degrees, and the time for government endorsement by statutory regulation, is after the therapies have been shown to work, not before. You can download the entire exam paper. Here are a few highlights from it. So students, in 2009, are being taught the crudest form of vitalism. Teaching of traditional Chinese medicine is just as bad. Here are two slides from a course run by the University of Westminster. The first ‘explains’ the mysterious and entirly mythical “Qi”. 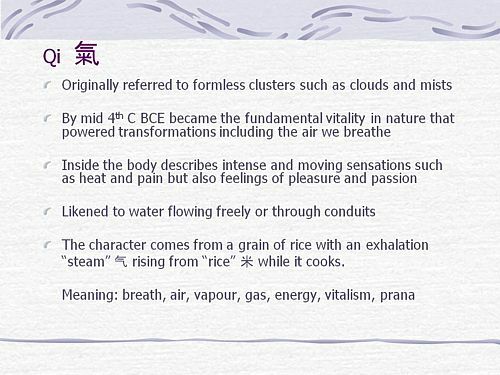 So “Qi” means breath, air, vapour, gas, energy, vitalism. This is meaningless nonsense. 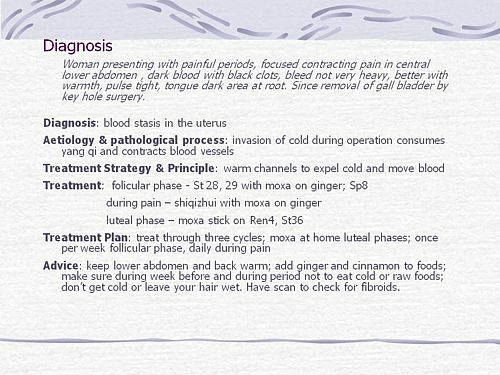 The second slide shows the real dangers posed by the way Chinese medicine is taught, The symptoms listed at the top could easily be a clue to serious illness, yat students are taught to treat them with ginger. Degrees like this endanger the public. There are more mind-boggling slides from lectures on Chinese medicine and cancer: they show that what students are being taught is terrifyingly dangerous to patients. It is entirely unacceptable that students are being taught these ancient myths as though they were true, and being encouraged to treat sick people on their basis. The effect of the Pittilo recommendations would be to force new generations of students to have this sort of thing forced on them. In fact the course for which this exam was set has already closed its doors. That is the right thing to do. This would be preposterous even in the life style section of a downmarket women’s magazine, The Pittilo report wants to make degrees run my people like this compulsory. Luckily the Univerity of Central Lancashire is much more sensible and the course is being closed. The matter is, in any case, being taken out of the hands of the government by the fact that universities are closing degrees in complementary medicine, including courses in some of those under discussion here, The University of Salford and the University of Central Lancashire have recently announced the closure of all the degree programmes in complementary and alternative medicine. The largest provider of such degrees, the University of Westminster has already shut down two of them, and the rest are being assessed at the moment. It is likely that the rest will be closed in the future. The revelation that Westminster had been teaching its first year students that “amethysts emit high yin energy” and that students had been taught to diagnose disease and choose treatments by means of a dowsing pendulum, showed very clearly the sort of utter nonsense that undergraduates were being forced to learn to get a ‘bachelors degree with honours’. It stretches credulity to its limits to imagine that the public is protected by degrees like this. Precisely the opposite is true. The universities have recognised this, and shut the degrees. One exception is Professor Pittilo’s own university which continues to run a course in homeopathy, the most discredited of all the popular types alternative medicine. I must certainly agree with the minister that protection of the public is an important matter. Having established that the Pittllo recommendations are more likely to endanger the public than protect them, it is essential to suggest alternative proposals that would work better. The monitoring of false claims, and of side effects of treatments, is also the responsibility of the Medicines and Health Regulatory Authority (MHRA). Rather than setting up complicated, expensive and ineffective ‘regulation’ by the HPC, all that need to be done is to ensure that the MHRA and/or Trading Standards have the funds to enforce existing laws. At the moment, they are not being implemented effectively, so I’d recommend that responsibility for enforcing the law against false health claims be transferred entirely to the MHRA, which has much more expertise in such matters than Trading Standards This would be both cheaper and more effective than the present system in which the responsibility is divided between the two organisations in an unclear way. more cheaply and more honestly than the Pittilo recommendations. There would be no reduction in patient choice either, There is no proposal to ban acupuncture, herbal medicine or traditional Chinese medicine. All that is necessary is to ensure that they don’t endanger the public. Since the root of the problem lies in the fact that the evidence for the effectiveness is very weak. the question of efficacy, and cost-benefit ratio, should be referred to NICE. This was recommended by the House of Lords Report (2000). It is recommended again by the Smallwood report (sponsored by the Prince of Wales Foundation). It is baffling that this has not been done already. It does not seem wise to spend large amounts of money on new research at the moment, in the light of the fact that the US National Institutes of Health has already spent over $1 billion on such research without finding a single useful treatment. The results of all this research has been to show that hardly any alternative treatment are effective. That cannot be ignored. So now we will have degrees in quackery. What, really, is the difference between acupuncture and psychic surgery? People will no doubt continue to use it and that is their right and their responsibility. But if the government were to accept the recommendations of the Pittilo report it would be seen, quite rightly, as being anti-scientific and of posing a danger to the public. Fortunately there is a better, and cheaper, way to protect the public. Margaret McCartney’s blog in the Financial Times puts rhw view of a GP with her usual sense, humour and incisiveness. Times Higher Education UK-wide consultation on CAM regulation is launched Excellent response from Andy Lewis. Some people still seem to think that acupuncture is somehow more respectable than, say, homeopathy and crystal healing. If you think that, read Barker Bausell’s book ot Trick or Treatment. It is now absolutely clear that ‘real’ acupuncture is indistinguishable from sham, whether the sham control uses retractable needles, or real needles in the ‘wrong’ places. There has been no clear demonstration of long-lived benefits in any condition, and it is likely that it is no more than a theatrical placebo. In particular, the indistinguishability of ‘real’ and sham acupuncture shows, beyond reasonable doubt that all the stuff about “energy flow in meridians” is so much hokum. There is a small group of ‘medical acupuncturists‘ that believes that it is hokum. but who nonetheless maintain that acupuncture works, despite the evidence to the contrary. But most acupuncturists go for the wholesale gobbledygook. If you don’t believe that, take a look at the exam paper that has come into my possession. It is this year’s exam from the University of Salford. Salford has, very sensibly, now decided to stop all its degrees in alternative medicine, so don’t hold this against the university too much. You can download the entire exam paper. Here are a few highlights. Oh really. Perhaps protons neutrons and electrons? OK I’d fail that one because the words have no obvious meaning at all. Perhaps an elementary textbook of embryology would help? How one would love to see a set of model answers for these questions. All this is ancient hokum being taugh to hapless students in the 21st century as though it were fact. The University of Salford has understood that and closed the course. All we need now is for NICE and the Department of Health to understand what it is that they are promoting. One of the recommendations is that acupuncture and Chinese herbal medicine should have statutory regulation by the Health Professions Council (HPC), despite the fact that that would involve the HPC breaking its own rules. Another recommendation of Pittilo is that entry to the “profession” (his word, not mine) should be by means of honours degree only. So he wants to impose on students exams like this one in order to “protect the public”? The absurdity of that proposal should be obvious now. This exam paper will form part of my evidence to the consultation. And there is one other small problem. Universities are busy shutting down their degrees in alternative medicine, now that the ridiculousness of what is taught has been exposed. They have shut down entirely at the University of Salford and at the University of Central Lancashire, And even the University of Westminster is working on closing them. All we need now is for the common sense and integrity that has been shown by these universities to spread to the Department of Health (and NICE). University of Central Lancashire stops its alternative medicine degrees (or does it?). Yes, it does! .The University of Central Lancashire (UCLAN) is the first place I asked to see teaching materials that were used on its homeopathy “BSc” course. The request was refused, and subsequent internal appeals were refused too, Clearly UCLAN had something to hide. Commissioner rejected all the grounds that UClan had used to evade the Freedom of Information Act. UClan appealed against the judgement and I still haven’t got the stuff but that hardly matters now, because the course in question shut its doors. In any case, plenty of stuff from similar courses has leaked out already. Meanwhile, in September 2008, UCLAN announced an internal review of all its courses in magic medicine, The review seemed to be genuine. For a start they asked me to give evidence to the review (something that no other university has done). They also asked Michael Eslea to give evidence. He is the UCLAN psychologist, whose magnificent open letter probably tipped the authorities into holding the review. As a consequence of concerns expressed by some colleagues within the University of Central Lancashire (UCLan) Dr Malcolm McVicar, Vice Chancellor appointed a working party to review the issues associated with the University offering courses in Homeopathy, Acupuncture and Chinese Herbal Medicine. The report was the subject of a special meeting of UCLAN’s Academic Board on 9th July 2009. The following resolutions were passed. R4 That the University consider how more interdisciplinary teaching can be achieved, where appropriate, within both undergraduate and postgraduate teaching to facilitate greater exposure to subject expertise and different paradigms. Resolutions 1, 3 and 4 say very little. Resolution 4 sounds thoroughly relativist. We are talking about medicine, about treating sick patients. There is only one “paradigm”. That is to find treatments that are as effective and safe as possible. There aren’t two sorts of medicine, regular and alternative. There is just medicine that works and medicine that doesn’t work. It’s a good illustration of DC’s rule number 2, “never trust anyone who uses the word paradigm”. Resolution 2 is the really interesting one, because none if the topics, Homeopathy, Acupuncture and Chinese Herbal Medicine, is subject to statutory regulation. If taken literally, resolution 2 means that all the UCLan courses in alternative medicine will close their doors. Bafflingly, this inevitable conclusion is not stated explicitly. At least resolution 2 means that homeopathy, already closed, will stay closed. It is never likely to get statutory regulation. For practical purposes, we can ignore for the moment the obvious fact that statutory regulation of nonsense subjects results only in nonsense. The only forms of alternative medicine that have got “statutory regulation” at the moment are chiropractic and osteopathy. The public has not been safeguarded by the General Chiropractic Council (GCC). The GCC, on the contrary, has endangered the public by allowing false health claims to be made with impunity. Perhaps the members of the review committee had not noticed that the Simon SIngh affair has resulted in almost 600 complaints being made to the GCC? The faith of the review in statutory regulation is clearly misplaced. Acupuncture and Chinese Herbal Medicine are not subject to statutory regulation at present, so one would suppose that these degrees will close their doors too. However the infamous Pittilo report has proposed that they should become regulated by the Health Professions Council (HPC). The many problems of the Pittilo report have been documented here, in “A very bad report: gamma minus for the vice-chancellor“. There was also a high-profile critique of the report in The Times (and on this blog). The HPC has, as one of its criteria for regulation, “evidence-based practice”. Disgracefully, the HPC has already shown its willingness to ignore its own rules and to act as statutory regulator for Acupuncture and Chinese Herbal medicine. This rather disgraceful behaviour is documented in “Health Professions Council ignores its own rules: the result is nonsense“. The UCLAN report seems to assume that the recommendations of the Pittilo report will be accepted. But the long-awaited consultation has still not opened. We can be sure that when it does, the opposition to it will be very strong indeed. Here are a few comments on the report itself. Download the full report (as of July 15th). i have to say that when I visited Preston to give evidence, my views seem to be treated seriously, even sympathetically, so it was a great disappointment to see the outcome. So what’s wrong? The major disaster is declared early in the report. 1. The quality of and/or absence of an evidence base to support claims of the efficacy and benefits of such treatments, linked to issues of public safety/protection and professional regulation. The whole point about CAM is that there is very little evidence that any of it works. So the review committee decided to ignore the most important problem of the lot. I can’t see how any rational decision can be made without first deciding whether the treatment is better than placebo. That, surely, is the main question, and it was dodged. UCLAN has failed to grasp the nettle, just as the Department of Health has also consistently failed to do so. Section 4,1 Efficacy This section repeats the assertion, absurd to my mind, that it is possible to judge CAM courses while declining to assess whether they work or not. Section 4.2 Role of Universities in Society. There is universal agreement that critical thinking is crucial to the idea of a university, but the judgement of whether CAM teaches critical thinking is simply fudged. Again the report fails to grasp the nettle. Sadly, the report dodged the crucial judgement once again. The most obvious characteristic of every form of alternative medicine is their total lack of critical self-appraisal. It is very sad that the review committee could not bring itself to say so. The nomenclature of courses, leading to a professional as well as an academic award, should reflect the professional route; for example Bachelor with Honours in Complementary Medicine, B Comp. Med. (Hons) or B Acupuncture (Hons). This sounds to me like another truly pathetic fudge. What on earth is solved by changing the name of the degree? You’d still be teaching students the same load of gobbledygook and then letting them loose on sick people, whether you call it a Bachelor of Science, a Bachelor of Arts, or, as is recommended here, a Bachelor of nothing whatsoever. Well, I suppose there is a (doubtless unintended) irony in calling CAM degrees “Bachelor of nothing whatsoever”. I find the logic by which this bizarre conclusion was reached quite impossible to follow. Like much of the rest of the report this conclusion seems to stem from a reluctance to grapple with the really important questions, like ‘does it work or not?’. Despite this the recommendation is perhaps the most interesting of all. This recommendation was accepted, and passed as a resolution at Academic Board. If it is implemented now, than there will be no more alternative medicine degrees next year at the University of Central Lancashire. If and when this happens, the University must be congratulated on its return to rational medicine. Michael Eslea, UCLAN’s hero in resisting nonsense from the inside, has posted on this topic. 17 July 2009. It seemed odd that that no announcement was made about the future if the remaining CAM courses at UCLAN. So I asked deputy Vice-Chancellor Patrick McGhee for clarification. After a couple of days, I got this response. I have been asked to respond to your question below on the running of acupuncture and Chinese herbal medicine at UCLan. It is correct to assume that UCLan will not be taking any new entrants onto these programmes until further notice. So the report may have been disappointing, but it has done the job. As several people have pointed out in comments, it would be asking too much to expect a university to say “sorry we just noticed that we have been running junk-science courses for years”. But they have done the right thing anyway. On 23rd May 2009, the Financial Times magazine published a six-page cover story about pseudo-scientific degrees by Richard Tomkins. The online version has the text but doesn’t do justice to the prominence that it was given. The print version had a much better title too, The Retreat from Reason. This article, which was some time in gestation, appeared shortly afte the last degree in homeopathy in the UK closed its doors. So perhaps it should have been called The Return of Reason. What’s interesting is that it has become commonplace for the mainstream newspapers to print articles like this and to dump some of their whackier lifestyle articles. The print version had a much better title too, The Retreat from Reason, with a two-page spread.. They published the entire ‘Patients’ Guide to Magic Medicine‘ as a sidebar on page 4. One part of the article that I particularly enjoyed is this. George Lewith, professor of health research at the University of Southampton’s medical school, is also director of the Centre for Complementary and Integrated Medicine, a private practice with ­clinics in Southampton and London’s West End, so it is no surprise that he is ready to speak out in support of complementary therapies. In fact, Southampton University – a member of the elite Russell Group – does not offer degree courses in complementary medicine, but Lewith defends the idea of offering them in principle, on the basis that, done properly, they produce better-trained practitioners. “Without the new universities’ involvement we might be faced with the quackery we saw in the 1940s and 1950s, when these people were outside medicine and were practising in an alternative fringe culture,” he says. Sorry George, you are still an “alternative fringe culture”. And universities are realising that, and shutting down courses all over the place. The FT published one response in its letter column, A bilious attack on complementary medicine. That’s the line used by quacks again and again and again (see, for example, integrative baloney @ Yale). I guess they have never heard of type 1 and type 2 errors. But that is a bit technical for homeopaths, so put it more simply. There is a quite remarkable absence of evidence for tooth fairies. So they must exist. Get it? The letter is from Allen Parrott of Yeovil. Could that be the Allen Parrott of the British Acupuncture Accreditation Board? If so he is “is an adult educationist who was Dean of Adult and Community Education at Yeovil College and a lecturer in the School of Education at Exeter University. As well as his work for the Board, he is currently working as an educational adviser for the Kent, Surrey and Sussex Deanery in the NHS.”. So no reason to worry about the standards of education in Yeovil, then. On 24 July 2006, I sent a request to the University of Central Lancashire (UCLAN), under the Freedom of Information Act (2000) I asked to see the teaching materials that were used on their BSc Homeopathy course. The request was refused, citing the exemption under section 43(2) of the Act (Commercial Interests). In May 2008, my appeal got to the top of the pile, and on 30th March 2009 a judgement was delivered. In all respects but one trivial one, the appeal was upheld. In future universities will not be able to refuse requests for teaching materials. The Decision Notice is on the web site of the Office of the Information Commissioner, [or download pdf file]. This whole thing has taken so long that the course at which it was aimed has already closed its doors last August (and blamed that, in part, on the problems caused by the Freedom of Information Act). UCLAN also announced a review of all its alternative medicine activities (and asked me to give evidence to it). That review is due to report its findings any time now. The full text of the Act is here. The following three exemptions were judged NOT to apply the requests for university teaching materials. I’ll quote some bits from the Decision Notice. 34. The public authority’s argument suggests that the requested information is reasonably accessible to the complainant if he enrols as a student on the course, and is therefore not accessible to him by any other means outside the Act unless he decides to make a total payment of £9,345 as a combined payment of three years tuition fees. 40. The Commissioner therefore finds that the public authority incorrectly applied the exemption contained at section 21 of the Act. 71. The Commissioner therefore finds that the section 43(2) was incorrectly engaged by virtue of the fact that the public authority’s ability to recruit students is not a commercial interest within the contemplation of section 43(2). 76. In addition to his finding on commercial interests the Commissioner finds that section 43(2) would in any case not be engaged as the likelihood of prejudice to the public authority’s ability to recruit students as a result of disclosure under the Act is no more than the likelihood of prejudice resulting from the availability of the course materials to students already enrolled on the course. 98. For the reasons set out above, the Commissioner finds that section 36(2)(c) is not engaged as he does not accept the opinion of the qualified person is an objectively reasonable one. He does not find that disclosure would be likely to prejudice the effective conduct of public affairs. 56. The Commissioner therefore finds the public authority correctly applied the exemption contained at section 41 to the case studies listed in Annex A. In the Commissioner’s view, even though the patients would not be identifiable if the case studies were disclosed, this disclosure would still be actionable by the patients. 100. He however finds that the exemptions at sections 21, 43(2), and 36(2)(c) are not engaged. • Sections 1(1)(b) and 10(1), because it failed to disclose the remainder of the course materials (i.e. excluding the case studies) to the complainant within 20 working days. • Section 17(1), because it did not specify in its refusal notice that it was also relying on sections 41 and 36(2)(c). • Disclose all the course materials for the BSc (Hons) in Homeopathy apart from the case studies listed in Annex A of this Notice. 104. The public authority must take the steps required by this notice within 35 calendar days of the date of this notice. BSc courses in homeopathy are closing. Is it a victory for campaigners, or just the end of the Blair/Bush era? The Guardian carries a nice article by Anthea Lipsett, The Opposite of Science (or download pdf of print version). Well you can say that again. The University of Westminster has refused to send me anything much, and has used flimsy excuses to avoid complying with the Freedom of Information Act. Nevertheless a great deal has leaked out. Not just amethysts emit hig Yin energy, but a whole lot more (watch this space). Given what is already in the public, arena, how can they possibly say things like this? Whatever next? [Note: Lewith told me later that he was quoted out of context by the Guardian, so it seems that after all he is happy with the courses. So sadly I have to withdraw the credit that I was giving him]. The article emphasises nicely the view that universities that run BSc degrees in things that are fundamentally the opposite of science are deceiving young people and corrupting science itself. Well, one can always hope. This letter appeared in the Times on Friday 30 January, 2009. It was prompted by the news from the University of Salford, but its main purpose was to try to point out to the Department of Health that you can’t hope to regulate alternative treatments in any sensible way while continuing to push under the carpet the crucial question of which ones work and which don’t. We would like to congratulate the vice-chancellor of the University of Salford, Professor Michael Harloe for his principled decision to drop “all the University’s programmes associated with complementary medicine within the School of Community, Health Sciences & Social Care”. This includes their “Homeopathy in Practice” degree. It is also encouraging that the University of Central Lancashire recently closed its BSc in Homeopathy to new students, and announced a review of all its activities in alternative medicine. Although universities are now taking sensible actions, government policy in the area of regulation of alternative medicine is in urgent need of revision. In May 2008 the Steering Group chaired by Professor Pittilo recommended to the Department of Health that entry into acupuncture, herbal medicine and traditional Chinese medicine should “normally be through a bachelor degree with honours”. But, in the same month, new regulations on Unfair Trading came into effect. One of the 31 commercial practices which are in all circumstances considered unfair is “falsely claiming that a product is able to cure illnesses, dysfunction or malformations”. One part of government seeks to endorse unproven and disproved treatments, at the same time as another part makes them illegal. The reason for this chaotic situation is simple. The Department of Health, and the Medicines and Healthcare products Regulatory Agency (MHRA), have consistently failed to grasp the nettle of deciding which treatments work and which don’t. That is the first thing you want to know about any treatment. Vice-chancellors seem now to be asking the question, and the government should do so too. The ideal mechanism already exists. The question should be referred to the National Institute for Health and Clinical Excellence (NICE). That was recommended by a House of Lords report in 2000, and it was recommended again by the Smallwood report (commissioned by the Prince of Wales) in 2005. Now it should be done. An earlier, longer, version of the letter tried to preempt the obvious criticism by including, as the second paragraph, this passage. In the same issue, there was a related article by the Times’ education editor, Alexandra Frean: Universities drop degree courses in alternative medicine..
“Universities are increasingly turning their backs on homoeopathy and complementary medicine amid opposition from the scientific community to “pseudo-science” degrees. The University of Salford has stopped offering undergraduate degrees in the subjects, and the University of Westminster announced yesterday that it plans to strengthen the “science base” content of its courses after an internal review which examined their scientific credibility. Both universities are following the lead of the University of Central Lancashire, which last year stopped recruiting new students to its undergraduate degree in homoeopathic medicine. Ian Appleyard, principal lecturer in acupuncture at London South Bank University, said that acupuncture should be studied for the very reason that it was not well understood from the standpoint of Western scientific medicine. Acupuncture had been used by a significant proportion of the world’s population for thousands of years. Uhuh, it seems that Ian Appleyard has been reading the misleading BBC report on the recent trials. In fact they show precisely the opposite of what he claims. The fact that advocates of alternative medicine can misinterpret the evidence so badly is, I guess, at the heart of the problem. What’s happening at the University of Westminster? Westminster has regularly been labelled as the University that has more quackery courses than any other. It is also the only university for which we have much idea about what is taught. The university, like all others, has tried to keep secret what they teach. That itself shows that they aren’t very proud of it. But a surprising amount has leaked out from Westminster, nonetheless. The set of “vibrational medicine” slides, including “Amethysts emit high Yin energy”, have caused much hilarity. The Westminster “miasmatic” examination question gets some laughs too, after it was published in Nature. The set of homeopathic materia medica notes that have come into my possession are pretty good too (coming on line soon). Recently it emerged that the University of Westminster had followed the example of the University of Central Lancashire (UCLAN), and set up a review of its activities in alternative medicine. But unlike UCLAN it was kept secret, and as far as one can tell, it asked for no input from critics. Well the outcome of this review turned up in my mail recently. Click the picture to read the whole letter from the Vice-Chancellor. There is no doubt that the outcome, so far, is rather disappointing. Here are some quotations from this letter, with my comments interleaved. Alan Jago is a pro- vice chancellor, and formerly from Westminster’s School of Architecture and the Built Environment, so no specialist knowledge there. Uhuh, sounds like box-ticking again When will universities learn that validation procedures are, on the whole, not worth the paper they are written on. “The overarching aim of these actions then is to strengthen and make more explicit the ‘scientific’ nature of the Integrated Health undergraduate degrees. Strengthen learning outcomes particularly in discipline and clinical modules to reflect the science outcomes embedded in the courses. Revise course specific regulations to explicitly identify that the core health sciences modules have to be passed to complete a degree of the BSc Scheme. Strengthen the final year project offer to provide more scientific projects through working with Biosciences staff. This seems to me to be whistling in the wind. Remember, we are talking about “bachelor of science” degrees in things like homeopathy and naturotherapy. These are things that are not science at all. In fact they are antiscience to their core. If you were successful in raising the increasing the scientific level of the staff, many of the subjects they are meant to be teaching would vanish in a puff of smoke. Certainly the responses of the Westminster staff to earlier enquiries (here, and here) showed little sign of scientific thinking. And I wonder what Westminster’s admirable biomedical scientists think about taking on homeopathy students for projects? “I am certain that this work will place Complementary therapies courses in an extremely strong position to meet the external challenges of the future. I’m sorry to say, Professor Petts, that the scientific community is not likely to share your certainty. Remember, Peter Fisher is on record as saying that there is not enough science in homeopathy to justifiy offering a BSc degree in it (watch the movie). He is the Queen’s Homeopathic Physician, and Clinical Director of the Royal London Homeopathic Hospital But Westminster still seems to know better. It seems, so far, that Westminster has missed a chance to change for the better. Times Higher Education published a pretty pathetic report on the Westminster audit. They did ask me for comments but then failed to publish most of them. I suppose a magazine like that is so dependent on advertising that they can’t afford to upset the authorities. Nevertheless, do they really have to be quite so bland? I hear that the internal audit has made everyone at the University of Woominster Westminster more nervous and that staff and students have been advised not to share teaching material with people outside the university. Having seen some of them, I’m not surprised they are ashamed of them. I’m perfectly happy to think of alternative medicine as being a voluntary, self-imposed tax on the gullible (to paraphrase Goldacre again). But only as long as its practitioners do no harm and only as long as they obey the law of the land. Only too often, though, they do neither. When I talk about law, I don’t mean lawsuits for defamation. Defamation suits are what homeopaths and chiropractors like to use to silence critics. heaven knows, I’ve becomes accustomed to being defamed by people who are, in my view. fraudsters, but lawsuits are not the way to deal with it. I’m talking about the Trading Standards laws Everyone has to obey them, and in May 2008 the law changed in a way that puts the whole health fraud industry in jeopardy. The gist of the matter is that it is now illegal to claim that a product will benefit your health if you can’t produce evidence to justify the claim. I’m not a lawyer, but with the help of two lawyers and a trading standards officer I’ve attempted a summary. The machinery for enforcing the law does not yet work well, but when it does, there should be some very interesting cases. The obvious targets are homeopaths who claim to cure malaria and AIDS, and traditional Chinese Medicine people who claim to cure cancer. But there are some less obvious targets for prosecution too. Here is a selection of possibilities to savour.. Hospitals, like the Royal London Homeopathic Hospital, that treat patients with mistletoe and marigold paste. Can they produce any real evidence that they work? Skills for Health and a whole maze of other unelected and unaccountable quangos which offer “national occupational standards” in everything from distant healing to hot stone therapy, thereby giving official sanction to all manner of treatments for which no plausible evidence can be offered. Perhaps even the Department of Health itself, which notoriously referred to “psychic surgery” as a profession, and which has consistently refused to refer dubious therapies to NICE for assessment. The law, insofar as I’ve understood it, is probably such that only the first three or four of these have sufficient commercial elements for there to be any chance of a successful prosecution. That is something that will eventually have to be argued in court. But lecanardnoir points out in his comment below that The Prince of Wales is intending to sell herbal concoctions, so perhaps he could end up in court too. We are talking about The Consumer Protection from Unfair Trading Regulations 2008. The regulations came into force on 26 May 2008. The full regulations can be seen here, or download pdf file. They can be seen also on the UK Statute Law Database. The Consumer Protection from Unfair Trading Regulations: a basic guide for business (pdf file). Has The UK Quietly Outlawed “Alternative” Medicine? Prohibition on 31 Specific Commercial Practices that are in all Circumstances Unfair (Schedule 1). One of the 31 commercial practices which are in all circumstances considered unfair is “falsely claiming that a product is able to cure illnesses, dysfunction or malformations”. The definition of “product” in the Regulations includes services, so it does appear that all forms medical products and treatments will be covered. (b) it causes or is likely to cause the average consumer to take a transactional decision he would not have taken otherwise. These laws are very powerful in principle, But there are two complications in practice. One complication concerns the extent to which the onus has been moved on to the seller to prove the claims are true, rather than the accuser having to prove they are false. That is a lot more favourable to the accuser than before, but it’s complicated. The other complication concerns enforcement of the new laws, and at the moment that is bad. “If we accept that mainstream evidence based medicine is in some way accepted by mainstream science, and alternative medicine bears the “alternative” qualifier simply because it is not supported by mainstream science, then where does that leave a trader who seeks to refute any allegation that his claim is false? The main defence against prosecution seems to be the “Due diligence defence”, in paragraph 17. (b) that he took all reasonable precautions and exercised all due diligence to avoid the commission of such an offence by himself or any person under his control. If “taking all reasonable precautions” includes being aware of the lack of any good evidence that what you are selling is effective, then this defence should not be much use for most quacks. A separate bit of legislation, European regulation on nutrition and health claims made on food, ref 1924/2006, in Article 6, seems clearer in specifying that the seller has to prove any claims they make. 1. Nutrition and health claims shall be based on and substantiated by generally accepted scientific evidence. 2. A food business operator making a nutrition or health claim shall justify the use of the claim. 3. The competent authorities of the Member States may request a food business operator or a person placing a product on the market to produce all relevant elements and data establishing compliance with this Regulation. That clearly places the onus on the seller to provide evidence for claims that are made, rather than the complainant having to ‘prove’ that the claims are false. On the problem of “health foods” the two bits of legislation seem to overlap. Both have been discussed in “Trading regulations and health foods“, an editorial in the BMJ by M. E. J. Lean (Professor of Human Nutrition in Glasgow). In fact the European Food Standards Agency (EFSA) seems to be doing a rather good job at imposing the rules. This, predictably, provoked howls of anguish from the food industry There is a synopsis here. “. . . EFSA in disgust threw out 120 dossiers supposedly in support of nutrients seeking addition to the FSD’s positive list. Here, of course,”unworkably high standard” just means real genuine evidence. How dare they ask for that! 19. —(1) It shall be the duty of every enforcement authority to enforce these Regulations. Nevertheless, enforcement is undoubtedly a weak point at the moment. The UK is obliged to enforce these laws, but at the moment it is not doing so effectively. Trading Standards originated in Weights and Measures. It was their job to check that your pint of beer was really a pint. Now they are being expected to judge medical controversies. Either they will need more people and more training, or responsibility for enforcement of the law should be transferred to some more appropriate agency (though one hesitates to suggest the MHRA after their recent pathetic performance in this area). Any “trader”, a person or a company. There is no need to have actually bought anything, and no need to have suffered actual harm. In fact there is no need for there to be a complainant at all. Trading standards officers can act on their own. But there must be a commercial element. It’s unlikely that simply preaching nonsense would be sufficient to get you prosecuted, so the Prince of Wales is, sadly, probably safe. Universities who teach that “Amethysts emit high Yin energy” make an interesting case. They charge fees and in return they are “falsely claiming that a product is able to cure illnesses”. In my view they are behaving illegally, but we shan’t know until a university is taken to court. Watch this space. New Zealand must have similar laws. They were ordered to pay fines and court costs totalling $23,400. On the difficult question of who must prove what, Douglas McLachlan, who wrote Has The UK Quietly Outlawed “Alternative” Medicine?, has kindly sent the following clarification. “I would agree that it is still for the prosecution to prove that the trader committed the offence beyond a reasonable doubt, and that burden of proof is always on the prosecution at the outset, but I think if a trader makes a claim regarding his product and best scientific evidence available indicates that that claim is false, then it will be on the trader to substantiate the claim in order to defend himself. How will the trader do so? Perhaps the trader might call witness after witness in court to provide anecdotal evidence of their experiences, or “experts” that support their claim – in which case it will be for the prosecution to explain the scientific method to the Judge and to convince the Judge that its Study evidence is to be preferred. (b) it materially distorts or is likely to materially distort the economic behaviour of the average consumer with regard to the product. It seems,therefore, that what matters is whether the “average consumer” would infer from what is said that a claim was being made to cure a disease. The legal view cited by Mojo (comment #2, below) is that expressions such as “can be used to treat” or “can help with” would be considered by the average consumer as implying successful treatment or cure. Concern has been expressed by some colleagues as to whether the University should offer courses in homeopathy, Herbalism and Acupuncture. Therefore, to facilitate proper discussion on this matter I have set up a working party to review the issues. I have asked Eileen Martin, Pro Vice-Chancellor and Dean of the Faculty of Health, to lead this working party and report to me as soon as possible. Whilst the review is taking place, we need to recognise that there are students and staff studying and teaching on these courses which have satisfied the University’s quality assurance procedures and been duly validated. I would therefore ask that colleagues would refrain from comment or speculation which would cause concern to these students and staff. Staff who wish to express their views on this issue should direct these to Eileen Martin, by the end of September. “The University of Central Lancashire is to review all its courses in homoeopathy, herbalism and acupuncture after some staff said it should not be offering degrees in “quackery”, Times Higher Education has learnt. So far, so good. But of course the outcome of a committee depends entirely on who is appointed to it. Quite often such committees do no more than provide an internal whitewash. It does seem a bit odd to appoint as chair the dean of the faculty where all these course are run, and presumably generate income. Eileen Martin has often appeared to be proud of them in the past. Furthermore, the whole investigation will (or should) turn on the assessment of evidence. It needs some knowledge of the design of clinical trials and their statistical analysis, As far as I can see, Ms Martin has essentially no research publications whatsoever. I also worry about a bit about “satisfied the University’s quality assurance procedures and been duly validated”. One point of the investigation should be recognise frankly that the validation process is entirely circular, and consequently worth next to nothing. It must be hard for a vice-chancellor to admit that, but it will be an essential step in restoring confidence in Uclan. Let’s not prejudge though. If there are enough good scientists on the committee, the result will be good. I hope that transparency extends to letting us know who will be doing the judging. Everything depends on that. Well well, there’s a coincidence, Once again, the week after a there is an announcement about degrees in witchcraft, what should pop up again in the column of the inimitable Laurie Taylor in THE. The University of Poppleton’s own Department of Palmistry. I was shocked to see yet another scurrilous attack upon the work of my department in The Poppletonian. Although Palmistry is in its early days as an academic discipline it cannot hope to progress while there are people like your correspondent who insist on referring to it as “a load of superstitious nonsense which doesn’t deserve a place on the end of the pier let alone in a university”. A large number of people claim to have derived considerable benefit from learning about life lines, head lines and heart lines and the role of the six major mounts in predicting their future. All of us in the Palmistry Department believe it vitally important that these claims are rigorously examined. How else can science advance?